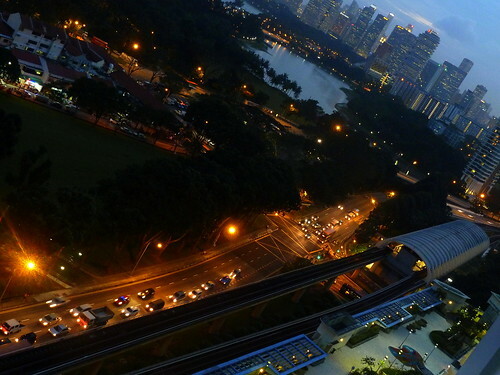 After sometimes I don't take photos from NDP because it is too numerous. So I depended on others to give one or two photos of the NDP. 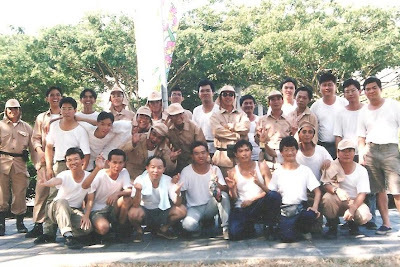 Photos courtesy of Soka Gakkai Members. 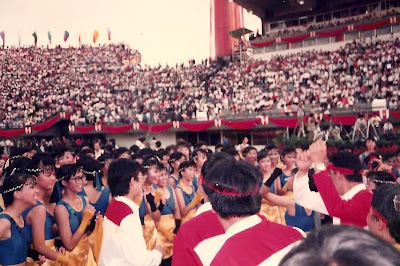 I had performed in altogether 25 major cultural shows including Singapore National Day Parade, Chingay Parade(props assembling), Youth Peace Cultural Show, South East Asian Games etc. When I was young I love to go up to the ten floor of a building to watch the fireworks. TV Presenter joined us for a photo taking sessions. Nowadays more exciting stunts were added. This is a Flickr badge showing public photos from leonghimwoh. Make your own badge here. At a hotel in Xian China, they were struggling to put up a 3 layer human tower. I went forward and gave a notch and help to push a person's buttock up to help him to stand up, they were surprised by the move. My suggestions on putting up a five layer human tower. To put up the five layer tower, we need to solve the third layer first. The third layer is the most critical of all the layers. It need to climb up to the second layer shoulder, sit on it and stand up with the top two layer on top of their shoulder, that is four persons(top man & 3 second layer persons). With no assistance from the safety officer. To train these three top layers first will solve most of the problems, first choose the lightest persons to put on the upper layers. They use to put only five persons on the third layer, which is not enough. The third layer got difficulty to stand up with five persons, with the equivalent of nearly a person on their shoulders and stand-up. I suggest increase to 6 persons. These 6 persons or the third layer, should be given the most attentions. They should be the persons to train first in order to build their endurance and stamina. Ask them to go back home do so extra sit- up with weight training or put weight on their shoulder to train. These will solve the problem. I used to find that they spend to much time training the bottom two layers, which doesn't matter so much. If overexert they usually at the later part of the training doesn't have much energy. So it defeat the purpose. Because the safety officers can compensate their weakness and support them. To sit and stand up with a person on top of your shoulder, train a few times exert a tremendous amount of energy it can be very tiring. Few of them are not regular. So sometimes they come, sometime they don't, make the training of the bottom 2 layers difficult. This could neutralise the effect of training. To assist the 2nd bottom layer, two safety officers to support one bottom second layer person. One person left and another right. One hand support the second layer person left buttock and another right kneel cap. Then help to push his buttock up for him when he going to stand up, one hand to hold his knee cap, so to not to let it bend and another to hold heel, after he stand up to reduce the pressure on the shoulder of the bottom layer. If possible the safety officer body to stay as close as possible to the person he is supporting, so he can utilise his strength most and don't allow the second bottom layer sway too much which will affect the upper layers. Usually the swaying/unbalance of the the persons in the sitting positions moving to the standing positions cause the fall of the towers due to the imbalance of some of them standing up, some slower some faster and the upper layer tilt to much to one direction( due to fatigue or not enough strength). The safety officers play key role, he got to ensure all of the same layer move up at the same time. His one hand got hold the buttocks of the second bottom layer, so to absorb the pressure of the 3 upper layer on the legs of the second bottom layer, the equivalent of 10 person weight on the shoulders of the second bottom layer. 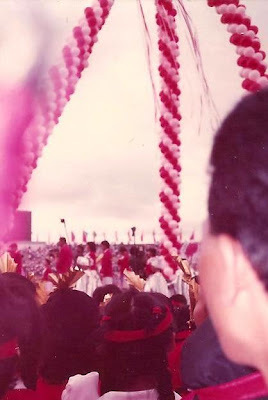 We hadn't put up a five layer human tower since 1983. Any better suggestions? 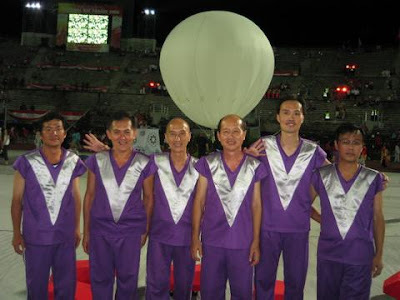 Some of the photos taken during my 18 times performances in the Singapore National Day Parade. The thrills/adrenlin rush. When moving in the stadium in a group, made the participation very exciting. 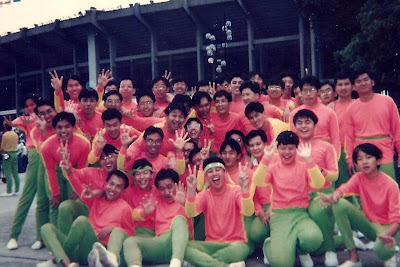 I had performed in the NDP since 1987, almost every year I had joined. I made lots of friends in the parade. Some times after the parade we had a gatherings at karoke. In Primary School, I used to do lots of somersaults and various gymnastics moves at my schools , and in my secondary school days I was in the school gym group. 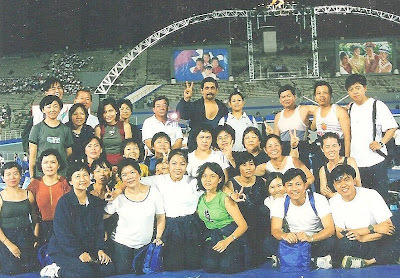 In the 1993 SEA Games Grand Finale our team were to put up a 4 layers human tower together with other human towers and other group gym display items. So for the years of my experience joining all these mass display item. I sometimes share my experiences with the less experience trainer. The top layer- one person, 2nd top layer 3 persons, sit and stand up carrying one person, third layer 5 persons sit and carry altogether 4 persons up, the bottom layer 8 persons , need the safety officers support to push the buttocks of the third layer up, as the bottom lays carry altogether 9 persons on their shoulders and hold them until the show end. After pushing the button of the third layer up, the safety officers is to hold the kneel caps of the third layers and straighten it and not to let it bend and shake. So through my year of experiences in gym, I informed the seniors about the problems of putting the heavier persons at the upper layers. In this type of human pyramid. It's very much depend on the weight of the person on top of the shoulders of the persons who carry him on their shoulders. Training can only do that much. Because the trainer is very young , and with little experience. He got difficulties understand the problems. Finally the top trainer came down and made a few changes, in the grand finale all the towers were able to put up all the towers successfully. What a memorable experiences . 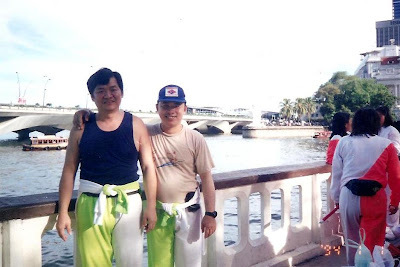 In 2006 National Day Parade, through my experience, I recommended to place more safety officers to support the bottom second layer. 5 persons got to carry a total of 4 persons on their shoulders sit and stand up. To make their tasks easier I suggested to the trainer, to suppot the bottom second layers' buttocks, when they climb up and sit on the bottom layer shoulder. And help to push their buttock up. 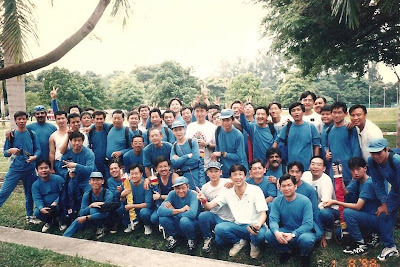 When their buttocks were pushed up, the safety officer one hand support their knee-cap and another support their heels, to reduce the pressure of the shoulders of the bottom layer. Hopefully next time around they are able to put up a five layer tower.Channelnewsasia/Mesmerizing undersea world. Interesting photos. My vision. After years of performing in the major cultural shows like NDP, and Youth Peace Festival & doing gym since my primary school days. Hope to share my ideas on How to putting up a five layer human tower.